The skinny little Buddha next to me smiled, but I had a strong feeling that He had not understood what I said. As he drove along at breakneck speed, I described my destination in all the languages I knew. My Buddha nodded indulgently, put his foot on the accelerator and finally stopped-outside the railway station! He whipped open the door smartly and with a radiant smile pointed to the station, which was obviously not the museum I was looking for. If only I had known a few words of Chinese! I went into the main hall and suddenly I had a brainwave. In the middle of it there was a bookstall with hundreds of postcards on sale showing all the interesting buildings in Taipeh and Taiwan. I bought postcards of all the places I intended to visit during the next few days. My Buddha nodded earnestly when I showed him the beautiful museum building and drove back the same way we had come. drove me to the lovely Palace Museum in Taipeh to meet Mr. Chiang Fu-Tsung. who had studied in Berlin and spoke German. I had been told this by Mr. Chi, proprietor of the best Chinese restaurant I have ever eaten in, the Lu- Taipeh in Lucerne. 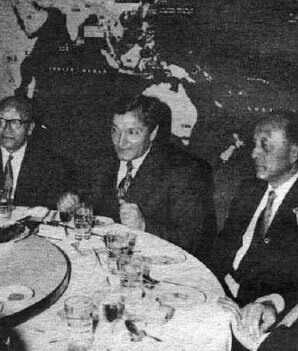 Mr. Chi spent most of his life as chef to Chiang Kai-Shek, before he decided to become a restaurateur in Switzerland. My friend Chi knew that I was obsessed with the desire to find out as much as I could about the mysterious finds at Baian Kara Ula. That was the site in the Sino-Tibetan frontier zone where the Chinese archaeologist Chi Pu Tei found 716 granite plates in 1938. They were 2 centimeters thick, with a hole exactly in the center from which a double-tracked grooved script ran out spirally to the edge of the plate. In fact they were rather like our long playing records. 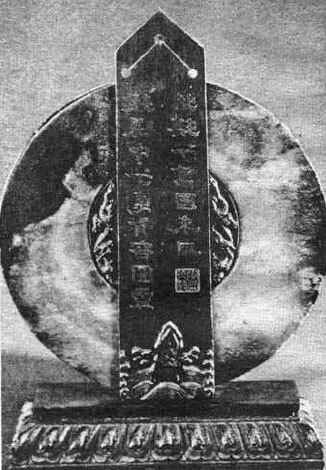 Brilliant scholars puzzled for years over the secret of the stone plates until Professor Tsum Urn Nui of the Academy of Prehistory, Peking, succeeded in deciphering part of the grooved scripts in 1962. Geological analysis showed a considerable cobalt and metal content; physicists established that all the plates had a high vibration rhythm, which led to the conclusion that they had been exposed to high electrical tensions at some time. The finds at Baian Kara Ula became a sensation when the Russian philologist Dr. Vyacheslav Saizev published some de-ciphered texts of the stone plates. They related that 12,000 years ago members of an alien people landed on the third planet, but their aircraft no longer had enough power to take off from that distant world. I have established these proven facts in detail in Gods from Outer Space. 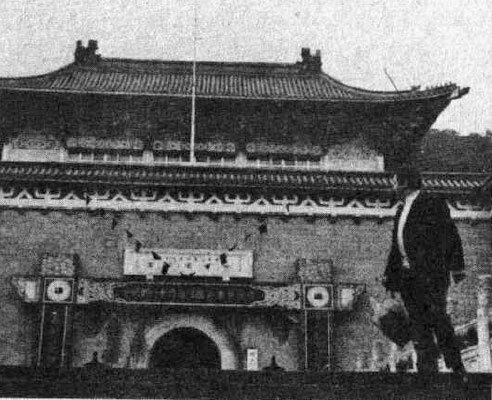 But the reason for my journey to Taiwan was that the news published in Moscow, the scholar’s full report on the stone plates, was deposited both in the Peking Academy and the Historical Archives at Taipeh. Thanks to a letter from my friend Chi, I had an appointment on this cold, wet January afternoon with the Director of the Palace Museum, who had confirmed our meeting in a courteous letter before I had even started on my third journey round the world. with Mr. Chiang Fu-Tsung, the Director of the Palace Museum. The chances of my getting on the track of the stone plates in the Palace Museum seemed very good. The precious collection, with more than 250,000 cataloged items, had been moved from its original home in Peking on several occasions during the last 60 years. In 1913, during the uprising of the Kuomintang Party, in 1918, during the Civil War, in 1937, during the war with the Japanese, who occupied Peking, and in 1947, when Mao Tse Tung founded the People’s Republic of China with the People’s Army of Liberation and made Peking the capital again. Since 1947 the art treasures have been stored in Taipeh. “You are a friend of my friend, you are my friend. Welcome to China. What can I do for you?” he asked. As we approached a low table, he gave an order aloud-to whom? Even before we could sit down, museum guards brought paper-thin porcelain cups and a decorated pot full of herb tea. The Director filled our cups. I went straight to the point and said that I was interested in the Baian Kara Ula finds and that I should like to see the scholar’s report on the stone plates that was here in Taipeh. 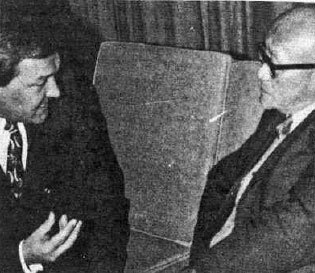 My enthusiasm was dampened when Mr. Chiang explained that this extensive report had not shared the Museum’s odyssey, but was still preserved in the Peking Academy, with which he had no contact. He noticed my intense disappointment, but could give me very little consolation with the rest of his information. The Director explained that there was no further evidence of Neolithic cultures in North China until the third millennium B.C. when the Yang-Shao culture on the Huang Ho produced painted ribbon pottery. About the second millennium B.C. came the Ma-Shang culture, the black pottery culture and the stone and copper culture of Sheng Tse Ai of Shantung, followed by the luxuriant decoration which came in with the beginning of the Bronze Age with the t’ao t’ieh, or monster mask, and Li Wen with its broken right-angled representations of thunder. From the fifteenth to the eleventh centuries there was a highly developed script with more than 2,000 pictographic and symbolic characters which were used for oracular inscriptions. In all periods, it was the task of Chinese rulers, the “Sons of Heaven,” to see that the course of nature unfolded in an orderly manner. 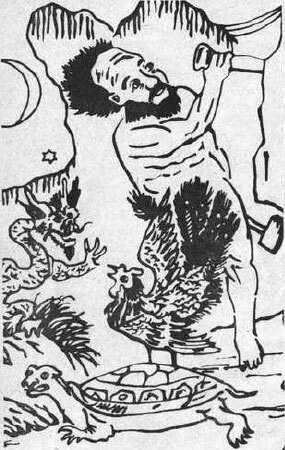 Chinese brush drawing of the God P’an Ku, legendary master of chaos and constructor of the Chinese universe. He is supposed to have built the world out of granite blocks that flew down from space. According to legend, every ruler and “Son of Heaven” is supposed to have lived for 18,000 terrestrial years and if we take this estimate at its face value, Fan Ku brought order into the heavens 2,229,000 years ago! Perhaps these astronomical calculations may be a few years out here and there, but what does it matter with such a family tree? 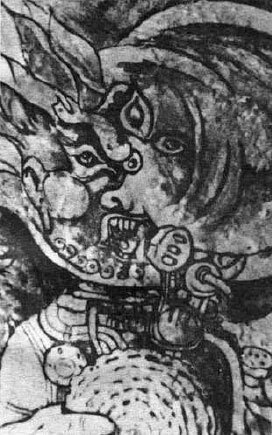 Fan Ku, whose legend is said to have spread throughout China, was depicted differently in different regions, which is not surprising in view of the vast size of this country with its surface area of 3,800,000 square miles. Sometimes he is a being with two horns on his head and a hammer in his right hand, sometimes he appears as a dragon mastering the four elements, sometimes he holds the 3 sun in one hand and the moon in the other, some-times he is chipping away at a rock-face, watched by a snake. Actually, the Fan Ku legend in China is probably not so old as the mighty man himself. Travelers from the kingdom of Siam (Thailand) are reputed to have brought the legend to China for the first time in the sixth century. “Chinese mythology describes Yan Shih Tien-Tsun as the ‘father of things,’” said the Director. I shook my head. The Director took a volume of the Dictionary of Chinese Mythology from his shelves. The Director appointed the best-informed member of his staff, Marshal P. S. Wu, Head of the Excavation Department, to act as my guide during my stay. Although only a fraction of the 250,000 items in the Museum are on display at any one time, there is still such a bewilderingly large number that I could scarcely have collected my “finds” without the help of Mr. Wu who understood instinctively what interested me. Bronze vessels from the period of the Shang dynasty (1766-1122 B.C.) automatically reminded me of the other side of the Pacific. Nazca pottery, pre-Inca work much more recent than the Chinese vessels, exhibits very similar ornaments: geometrical lines, opposed squares and spirals. A jade axe, a small copy of a larger one. The divine symbol of the dragon with a trail of fire is engraved on the greenish stone; the firmament is decorated with spheres. I remembered identical representations on Assyrian cylinder seals. those on toothed wheels round the circumference. Were they made from models? Altar trappings for the worship of the god of the mountains and clouds is the orthodox archaeological label under a right-angled object dating to 206 B.C. A mountain is visible, but it is dwarfed by a giant sphere with a trail of fire. This sphere, which has three small spheres arranged geometrically above it, is so big that it seems to be quite unrelated to sun, moon and stars. Altar trappings? It is far more likely that in the remote past this picture recalled some unforgettable, incomprehensible phenomenon in the sky. Jade discs (Fig. 34) with a diameter of 2 ¾ to 6 ½ inches. They have holes in the middle like phonograph records. They are held upright against 7 ¾-inch-high obelisks by pegs. Once again I do not believe the archaeologists when they say that these ceremonial discs were divine symbols of power and strength, and the obelisks phallic symbols. I was fascinated by the jade discs, many of which had neatly milled sharp angles like those on toothed wheels round their circumference. Is there some connection between these so-called ceremonial discs and the stone plates from Baian Kara Ula? 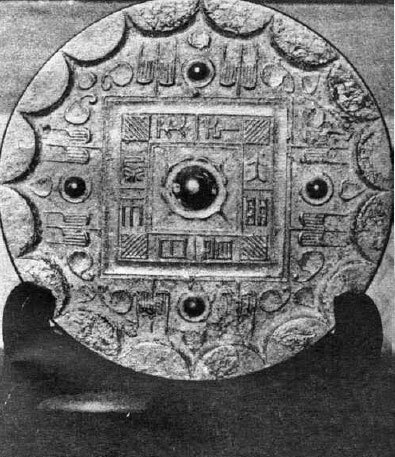 If we accept that the plates from the Sino-Tibetan border region were models for the ceremonial discs, the veil enshrouding the mystery would be lifted. 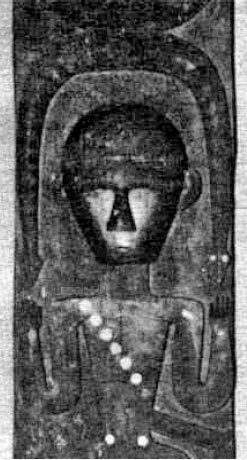 After a visit to the Baian Kara Ula region by the astronauts who made the plates, presumably for transmitting information, reverent priests imagined that they would be doing work pleasing to God or even acquire some of the qualities of the brilliantly clever beings who had vanished simply by making discs like those that the strangers had used. That would square with the current archaeological explanation of the discs, for by this roundabout route they actually could have become religious trappings. 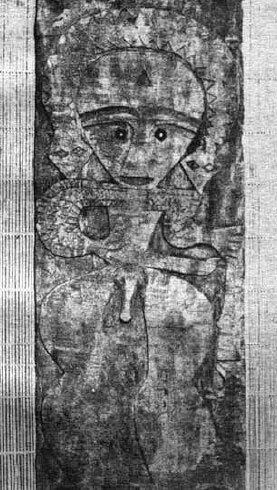 Dr. Vyacheslav Saizev, who published important data about the stone plates, found a rock painting (Fig. 35) near Fergana, in Uzbekistan, not far from the Chinese frontier. Not only does the figure wear an astronaut’s helmet, not only can we identify breathing apparatus, but in his hands, isolated by the spaceman’s suit, he holds a plate of the kind found by the hundreds at Baian Kara Ula! “In a long past age the ancient sage Yuan Shih Tien Wang lived in the mountain on the edge of the eternal ice. He told stories about olden times in such picturesque language that those who heard him believed that Yuan Shih himself had been present at all the wonderful events. One of his listeners, Chin Hung, asked the sage where he had lived before he had come to the mountain. Dr. Vyacheslav Saizev found this rock painting near Fergana, in Uzbekistan. An astronaut holds a disc, similar to those found by the hundred at Baian Kara Ula. A recording? Taipeh, the capital of Formosa (or Taiwan) and Nationalist China, has nearly two million inhabitants, universities, high schools and exceptionally well-run museums. From its main port of Keelung products such as sugar, tea, rice, bananas, pineapples (which flourish in the tropical monsoon climate), wood, camphor and fish are exported. Since Taiwan, with a population of 13,000,000, became an independent country in 1949, its industry has grown at a fantastic rate, so that today textiles, all kinds of engines, agricultural machinery, electrical goods, etc., with “Made in Taiwan” stamped on them, are loaded on to ships for customers all over the world. The government encourages the mining of gold, silver, copper and coal, which brings in foreign exchange. Once again it is not clear whence and when the original Mongolian inhabitants, the Paiwan, came to the island. Today a quarter of a million of them live in seven different tribes in the most inaccessible part of the mountain range, where they were driven by successive waves of Chinese invaders. Only a generation ago, Paiwan warriors showed their bravery by head-hunting; today they hunt game in their mountain fastness. The tribes have survived in a remarkably pure state; they live according to the unchanging laws of nature. Their way of reckoning time is as simple as their way of life. The day begins at cockcrow; its passage is measured by the length of the shadows. The new year is recognized when the mountain plants start to blossom, its high point when the fruit ripens, its end with the first snow which cuts the tribes off from the world completely. wear the classical aprons of prehistoric astronauts to be found on many monoliths. From very early times, the Paiwans have practiced monogamy, so it is unimportant whether a suitor buys or abducts his bride, or woos her bashfully; the only thing that matters is that he keeps her for Me. The Paiwan’s favorite stimulant is betel, which he manufactures in his own homemade “laboratory” from the nutmeg-like fruits of the betel palm, with the addition of burnt lime and a good pinch of betel pepper. Betel tastes as bitter as gall, but is supposed to be refreshing. As betel turns spittle red and teeth blue-black, the friendly grin of a Paiwan warrior is frightening rather than reassuring. If I had not been reliably assured that they no longer practice head-hunting, I would have beaten a hasty retreat, because I need my head a little longer. The Museum of the Province of Taipeh possesses a unique collection of Paiwan wood carvings. Thenwood sculptures are considered to be the last examples of a dying folk art. They preserve primeval motifs from sagas and legends that have been handed down for many, many generations. Toltec monoliths in the Museum fur Volkerkunde, Berlin. 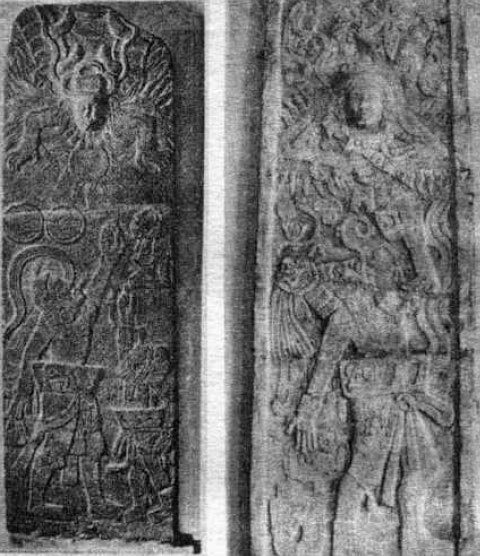 The left-hand picture is entitled “Ode to the Sun God.” It comes from Gods from Outer Space. which has plaster casts of the original. when depicting their own gods. Were they part of astronauts’ uniforms? The man who seeks for gods will find them. Hanging in the museum was a piece of wood 28 inches wide by 10 inches high. (Fig. 36.) Once upon a time, when hung on a hut, it meant: the chief lives here! To the left of the four striking concentric circles float two figures, who are wearing the by now classical “aprons” of prehistoric astronauts, of the land to be found, for example, on the Toltec monoliths (Fig. 37) in the Museum fur Volkerkunde in Berlin. Both figures are wearing a kind of overall, and shoes. The being on the left wears a helmet and extended ultra-short-wave antennae. A wooden sculpture (Fig. 38) represents a being with large genital organs, whose head is protected by a close-fitting helmet. A small triangle is engraved on the helmet, perhaps the emblem of his astronautical formation. A snake twines round his helmet. Symbol of loathsomeness in biblical times, in the sagas of the Mayas the snake rose again into the air as a “feathered creature,” and now it crops up again here among forgotten tribes in the mountain ranges of Formosa. All over the world we find snakes, flying snakes, in traditional popular art! 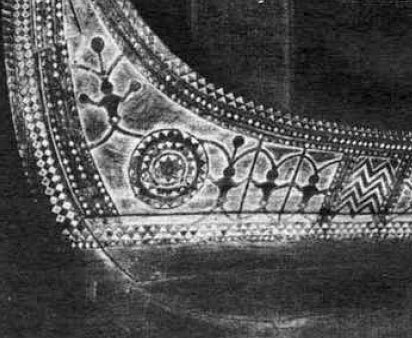 Why did the Paiwan paint their canoes (Fig. 39) with snakes, why are the heads of the “divine figures” round like helmets, why are they in (antenna) contact with each other and why do the contacts end in a “sun” with a series of toothed wheels inside it? Why do snakes (Fig. 40), twined round stars, gaze steadily heavenwards with their triangular heads? Why does a Paiwan god hold a snake that passes above him and his helmet? Why in particular is a female goddess (Fig. 42) concealed in a mask, why does she wear clumsy goggles and why is there a snake above and around her head? Obviously this outfit was never chic, but it was suitable for a space flight and the snake symbolized a limit to cosmic flight. All this should be interpreted in terms of early religions, say the archaeologists. They say that snakes were divine “symbols of reverence.” If so, why did not the Paiwans use fish, sharks, waves or turtles as models, when they painted their canoes with symbols of religious provenance? Why did not the chief pin a shield that bore the sign of his tribe (there were some beautiful ones) on the wall of his house? The carvings, which are often half-rotten, are extremely lovely. 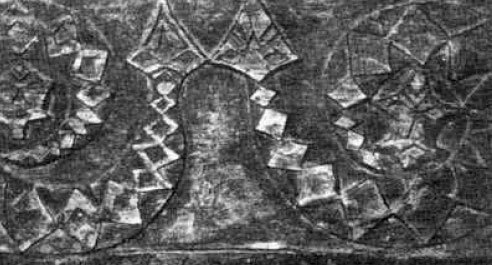 They all have concentric circles and spirals, and they continually emphasize the connection between man and snake, with the snake always hissing heavenwards above the figure. Frequently the figures are carved in a floating, as opposed to a standing position, as if they were weightless. I do not think such reproductions were the products of artistic imagination. 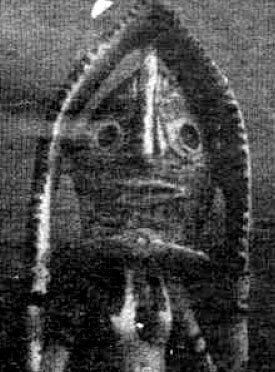 The first ancestors of the Paiwan must have seen that it was possible for beings to float in the air and told their descendants so. and Monte Alban, Mexico. And a snake is coiled round his helmet. A space symbol. Why did the Paiwan paint their canoes with frescoes of the gods, like the ancient Egyptians? What do the figures’ linking up antennae mean? 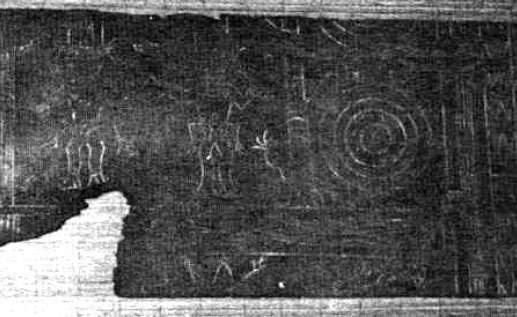 Snakes coiling round stars with their triangular heads staring heavenwards On a Paiwan wooden tablet. the ancient emblem of the space traveler. Paiwan goddess in a space traveler’s mask. She holds a snake, symbol of the universe, in her hands. The Paiwan are still primitive even today. In their masterly carvings they represent both real things from their environment and also the stereotypes which come from a kind of collective unconscious going back to time immemorial Their contemporary woodwork shows that the Paiwan carvers are quite up to date. They perpetuate men in Japanese uniforms, with their weapons. They have seen these men. They are not straining their imaginations. They have never done so; in all ages they represented what they had actually seen in artistically perfect combination with traditional motifs. An especially remarkable motif is a three-headed being flying in a snake-a motif that recurs in a silk manuscript of the Chou culture (1122-236 B.C.). Mr. Y.C. Wang, Director of the Historical Museum, Taipeh, showed me round his collection of representations of mythological beings, half men, half animals, often with bird’s heads on winged bodies, parallels to the Assyrian and Babylonian winged gods. Seals from the Chou period are as numerous as the rings in a jeweler’s showcase. Up to 1 centimeter in size they do not appear to have been simply decorative ornaments. Under my magnifying glass, they looked remarkably like integrated circuits. There were also some “bronze mirrors” from 2 ¾ inches to 5 inches in diameter engraved with symbols and characters that have been partially deciphered. For amusement’s sake, I have reproduced the square in the center of this bronze mirror (Fig. 43) in comparison with two integrated circuits from the firm of Siemens. The geologist Thuinli Lynn told me about a discovery that is unknown to the western world. “Wherever suns shine, there is life,” reads the inscription oh a bronze mirror. Engravings like those on this mirror could easily be taken for modern integrated circuits! During excavations in the “Valley of Stones” in July, 1961, Chi Pen Lao, Professor of Archaeology in the University of Peking, came across an underground cave system. At a depth of 105 feet he found entrances to a labyrinth in the spurs of the Honan mountains, on the south shore of Lake Tung Ting, west of Yoyang. He located passages that undoubtedly led under the lake. The passage walls were smooth and glazed. The walls of one hall, into which several passages led, were covered with paintings. They represented animals, all fleeing in one direction, driven by men who held “blowpipes” to their lips. Above the fleeing animals, and this is the sensational part of the account as far as I am concerned, flies a shield on which stand men holding weapon-like implements which they are aiming at the animals. The men on the “flying shield,” says Mr. Chi Pen Lao, wear modern jackets and long trousers. Mr. Lynn thinks that scholars have probably succeeded in establishing the date when the tunnel was built, but news from Red China only emerges sparingly and after long delays. The report of the “flying shield” and the men aiming at the animals from above at once reminded me of a museum piece which had left an indelible impression on my memory. It was the skeleton of a bison (Fig. 44), whose brow had been pierced by a neat shot, and I had seen it in the Museum of Paleontology in Moscow. The original home of the bison was Russian Asia. The age of my fossil bison was dated to the Neolithic (8000 to 2700 B.C. ), when weapons were still made by flaking stones, and the most modern weapon created in that period was the stone axe. A blow with a stone axe would inevitably have shattered the bison’s skull, but under no circumstances could it have left a bullet hole. A firearm in the Neolithic? In fact, the idea seems so absurd that the experts could dismiss it with a wave of the hand, if it were not for the fact that the Neolithic marksman’s bison trophy is on show in Moscow. 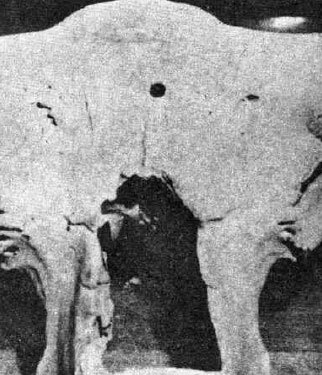 This skeleton of a bison from the Neolithic can be seen in the Museum of Paleontology in Moscow. The hole in the skull could only have been made by a firearm. Who on earth possessed firearms in 8000 B.C.? President Ku Cheng-Kang gave a dinner for me attended by scholars, politicians and museum directors. They all helped my inquiries. On the eleventh and last day of my stay in Taipeh, President Ku Cheng Kang, Member of the National Assembly, gave a dinner for me. I was surrounded by distinguished politicians and scholars: B. Hsieh, Professor at Fuyen University, Shun Yao, still UNESCO Secretary-General representing the Republic in January, 1972, Hsu Chih Hsin and Shuang Jeff Yao of the Public Relations Department, Senyung Chow of the Government and of course my museum friends, Chiang, Lynn, Wang and Wu. These gentlemen’s names are supposed to be as common as Smith, Jones and Brown. I tried hard to identify all the happy smiling faces, but I could not manage to put the right name to them. While I was flying to the Pacific island of Guam by TWA, I drew up a balance of my visit. I had not been able to see the report on Baian Kara Ula, but I had been able to eliminate a white spot on my map of the abodes of the gods on Chinese territory. PS. : My film Chariots of the Gods? has been bought by Comrade Mao’s State Film Lending Library. Perhaps he will help me to make a study trip to Peking. With a post-card in my hand, I’ll easily find my way to the Academy with the historical archives. Besides I have been wanting to visit the Gobi Desert for a long time.